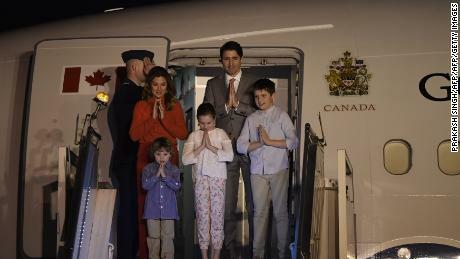 Though the Canadian leader is more than halfway through a week-long trip, he has yet to meet with a single senior member of the Indian government, sparking widespread speculation he has been "snubbed" by New Delhi.Trudeau landed in India along with his wife and three children on Saturday, beginning a winding tour across the country that has so far seen the family pictured at the Taj Mahal and wearing traditional dress at Mahatma Gandhi's ashram in the western state of Gujarat. Missing from the picture at any of these locations, as well as during the family's initial arrival in Delhi, is Indian Prime Minister Narendra Modi. "The optics don't look good," said Vivek Dehejia, a senior fellow at Mumbai-based think tank IDFC Institute. "All you can see are the Lonely Planet-style pictures of his family at the Taj Mahal and in Gujarat, but he's not had a single official event. "Modi is known for his hugging diplomacy. He is pictured in awkward bear hugs with leaders including both former and current US Presidents Barack Obama and Donald Trump. Trudeau's visit, in particular, is playing in stark contrast with the recent visit of Israeli Prime Minister Benjamin Netanyahu, who just last month was greeted with a hug by Modi immediately upon landing in Delhi. 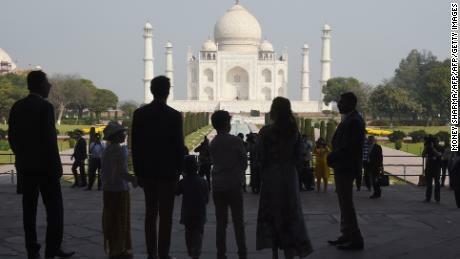 All this "is creating a perception that this a lower-level relationship, that this is a less important relationship to India," said Dehejia, who is also an economics professor at Carleton University in Canada. Trudeau is in town at the same time as Donald Trump Jr., the son of US President Trump, who is in India on a private visit to promote real estate deals across four cities. The two trips have drawn comparisons online, with analysts watching carefully to see whether the arrival of Trump Jr., who holds no official government title, is afforded more attention than that of the Canadian Prime Minister. Speaking to CNN, India's former ambassador to Canada Vishnu Prakash refuted suggestions that Trudeau was being ignored, describing the situation as "a storm in a teacup." "I'm a little puzzled frankly, by the basis of which this is being said, there's no departure from protocol," said Prakash, adding that Trudeau is an "esteemed guest. "Trudeau has also dismissed the concerns, telling a Canadian news channel that he met Modi "very recently. "According to an official agenda released by the Indian government Trudeau is due to meet with Modi on Friday in Delhi. But that hasn't stopped speculation in local media in both India and Canada linking Trudeau's reception — or lack thereof — to the issue of Sikh separatists. Canada is home to about 468,000 Sikhs, comprising 1.4% of its population. A small but influential number of those Sikhs support the idea of Khalistan, or the demand for a separate state for Indian Sikhs. The separatist issue goes back decades in India, with one of the most important clashes occurring in 1984 when Indian Army soldiers stormed the Golden Temple in Amritsar, Sikhs' holiest site, in an effort to capture separatist leaders. In response, two Sikh bodyguards assassinated India's then leader, Indira Gandhi.In 1985 the violence spilled over into Canada, when Sikh separatists bombed an Air India plane that had taken off from Toronto airport, killing all 329 people aboard, including numerous Canadians of Indian descent. The only person who was convicted in the bombing was released in 2017 by Canadian courts after serving two decades in jail. Analysts point to Trudeau's appearance at a Sikh event in Toronto last year, where separatist flags and posters depicting an extremist Sikh leader killed in the 1984 Indian Army operation were displayed, as a particular area of contention. "That is certainly a matter of greater concern because it goes to the core of India's unity and integrity and that is an issue that needs to be sorted out between the two countries," said Prakash, who described the event Trudeau attended as "an out and out Khalistani platform." Speaking to CNN, Dhruva Jaishankar, a fellow at Delhi-based think tank Brookings India, agreed that Modi's apparent cold shouldering of Trudeau was significant. "This is quite clearly a strong signal that India is very unhappy with the Trudeau government for its approach to this (separatist) issue," said Jaishankar, though he cautioned that the relationship was "multifaceted" and operated on many levels. More than a million members of India's diaspora live in Canada and the two countries have maintained longstanding cooperative agreements in sectors ranging from energy security to education. Trade between the two countries stood at an estimated $6 billion in 2016.Two stalled trade agreements — one on fair trade and one on foreign investments — have been under negotiation since 2010, and hopes had been high that Trudeau's visit would help to push those talks forward.